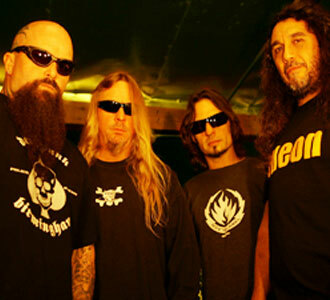 Slayer Biography, Discography, Music News on 100 XR - The Net's #1 Rock Station!!! The Heavy-Metal, Thrash-Metal outfit Slayer was established by the lead guitarist Kerry King in Huntington Beach, California USA, in 1982; originally dubbed Dragonslaye, the band's line-up also included vocalist + bassist Tom Araya, guitarist Jeff Hanneman and drummer Dave Lombardo. Slayer's first album, "Show No Mercy", came out in late 1983 on Metal Blade Records; at the time of its release, the band received first major exposure by appearing on the covers of several Metal magazines and earned great respect in the underground Metal community. After their first tour across the United States, the band recorded three songs for their "Haunting The Chapel" EP. The band's second full-length release, 1985's "Hell Awaits", expanded on the darkness of the previous EP, as hell and Satan were common song subjects; it contained only 7 tracks, three of which clocked in at over 6 minutes. After being offered a recording deal by Rick Rubin's Def Jam Records, Slayer signed and quickly began working on its third LP with Rubin as co-producer. The result, "Reign In Blood", still largely considered the greatest Thrash-Metal album ever recorded and even credited with almost single-handedly inspiring the entire Death-Metal genre, at least in North America. The record hit #94 on The Billboard Top 200 chart and went on to sell over 500,000 copies, however, some problems came along after its release; because of the song "Angel Of Death", that deals with Auschwitz doctor Joseph Mengele and the experiments he did on his patents during the Holocaust, Slayer were accused of being Neo-Nazis, also Jeff Hanneman was really interested in war medals at that time so he wore some Nazi cross and eagle symbols on his jacket. "South Of Heaven", released in July 1988, marked a significant musical departure; to contrast the aggressive assault put forth on their previous album, Slayer consciously slowed down the tempo of the record as a whole; the band's fourth full-length disc, the last for Def Jam, reached the #57 position on The Billboard 200 but the new sounds disappointed some of the band's fans who were more accustomed to the style of earlier releases. The follow-up album, 1990's "Seasons In The Abyss", was more of a return to the sound of "Reign In Blood" and was greeted warmly by fans; a video clip for the title-track had the band playing in the Middle-East, shortly before the start of the Gulf War. The record peaked at #40 in U.S. and climbed into the U.K. Top 20 Albums chart. A double live album, "Decade Of Aggression", was released in October 1991 and aside from a brief tour the next year, including an appearance at the 1992 Monsters of Rock festival at Castle Donington, nothing new would be heard from Slayer until 1994's "Divine Intervention", this album marked drummer Paul Bostaph's studio debut with the band and became another success rocketing to #8 on the Billboard Top 200 and going gold in no time; it was also their highest chart entry in Great Britain at #15. Released as a sort of stopgap album, "Undisputed Attitude", followed two years later; consisting of 13 covers and one brand new song written by frontman Tom Araya, the disc reached #34 in the States. "Diabolus In Musica", Latin for “The Devil in Music” was released in June 1998 and marked, along with an altered logo, a change in compositional style for the band. This style incorporated a new groove into some song structures and fan reaction was divided. The album stalled just outside the top 30 in U.S. and barely finished inside the top 30 in Great Britain, nevertheless, a successful world tour followed. On September 11, 2001, the veteran California thrashers issued their next studio record "God Hates Us All". Some promotional material announcing the album title and release date drew an unintended connection with the 9/11 terrorist attacks. The 13-song set peaked at #28 on The Billboard 200 and #9 on the Top Canadian Albums charts. In the summer of 2006, Slayer released their first studio album in six years, "Christ Illusion" and its first studio effort with the original line-up, including drummer Dave Lombardo, since 1990's "Seasons In The Abyss". The album went gold in U.S. and Slayer achieved the career highest chart debut on the Billboard 200 at #5. The first single, "Eyes Of The Insane", gave the band its first Grammy for Best Metal Performance. "Christ Illusion", which hit #3 on the Top Canadian Albums chart and climbed into the top 10 in Australia, was re-released in mid-2007 as a special edition, a CD/DVD set featuring the previously unreleased track "Final Six" and an alternate version of "Black Serenade". In February 2008, at the 50th Annual Grammy Awards ceremony, Slayer won its second Grammy, taking the Metal honor for "Final Six". The quartet issued their tenth album of all-new-material, "World Painted Blood" in November 2009; the disc, which included the single "Hate Worldwide", hit #12 on The Billboard 200.